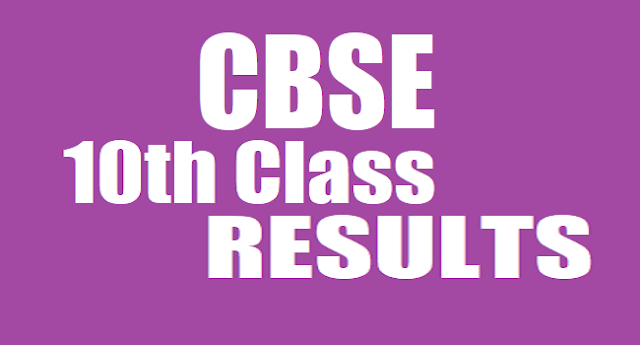 CBSE Class 10th results 2019: Good news for all CBSE Board 10th Class students , CBSE 10th Result 2019 is going to be announced. Results.gov.in has updated that CBSE Xth Class Result 2019 will be available in 3rd week of May. The Central Board of Secondary Education (CBSE) Class 10 results will be out on May 29 on results.nic.in, cbseresults.nic.in, cbse.nic.in. The exams for Class 10 held in March. A total of 13,73,853 students have appeared for the Class 10 exam. CBSE Result 2019: Class 10th Results 2019 will be declared in 3rd week of May: On Thursday, April 4, 2019, the Central Board of Secondary Education (CBSE) dispelled rumours circulating on social media that CBSE board exam results 2019 will be released in April. A circular apparently signed by the controller of examinations of the board was doing rounds on social media. "The circular is fake and the official, whose signatures are there on the circular, no longer holds the post. The results will be declared in the third week of May," a CBSE official said. The Board is also planning to introduce 'experiential learning' for the upcoming academic session. "Experiential learning" will be the punch line for the CBSE in the academic session of 2019-20, the board said Thursday. CBSE secretary Anurag Tripathi said from now on every year, the board will have a punch line. "Students should learn from what they study and use it. It should not be rote learning for them, which they only learn for exams and then forget," he added. The CBSE will also thrust on academic improvement and soon will be unveiling a policy for it, he said. The Class X results for all the CBSE regions will be declared in 3rd week of May. This year also, the CBSE will post the results on net with the technical support of National Informatics Centre (NIC). The students can access their results through following websites:www.results.nic.in or http://www.cbseresults.nic.in or http://www.cbse.nic.in. The Board also specified that list of candidates from schools with respect to regular candidates and application forms from private candidates for compartment/6th subject for Class XII and Improvement of Performance (Class X) examination to be held in July 2019 will be accepted online. The online application and detailed instructions regarding this will be available on Board’s website http://www.cbse.nic.in from June 10. Students are advised to keep checking this space and the official websites cbseresults.nic.in and www.cbse.nic.in for latest updates. Results can also be accessed through search engine www.google.com or http://www.bing.com. How to calculate your CGPA points? The Central Board of Secondary Education (CBSE) has announced the Class 10 examination results. The results are in the form of Cumulative Grade Points Average (CGPA): It is the average of Grade Points obtained in all the subjects excluding the sixth additional subject as per the scheme of the exam. It is important to be familiar with the board’s grading system and its meaning to analyse and understand your performance. - Though your CGPA is written on the report card, it is easy to calculate it on your own. Here’s how you can do it. - Add your grade points in the main five subjects, and then divide it by 5. - You should know that though both your Class 9 and Class 10 grades are displayed on your report card, only Class 10 grades are used to calculate your CGPA.